This is an updated version of Jane Austen's Persuasion, which if you don't know, is a second chance love story. In Persuasion, Anne Elliot is persuaded to give up her imprudent engagement to a naval captain and comes to regret her decision deeply. This can be a hard one to update, I think, as Anne's decision was easier to excuse and understand, given the historical context. In the early 1800s she would have been completely dependent on her husband in the way that a modern woman wouldn't, so if he'd have been unsuccessful in his career not only could she have faced penury but could well have had a clutch of children dependent on her. 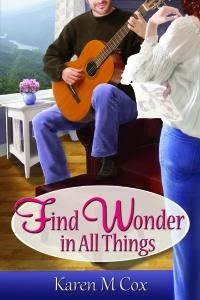 In Find Wonder in All Things we first meet Laurel and James as children in the 1980s. James is staying for the summer with a friend. He doesn't come back into the area for another few years, when Laurel is about 18 and James a couple of years older. They have a whirlwind romance and fall madly in love. James's family situation falls apart and he has to drop out of college due to finances. He wants Laurel to move away with him and pressurises her to leave. However, Laurel just isn't ready to take that kind of a risk; her family situation isn't the greatest due to her mother's depression, and she's just 18 years old. We don't see the first relationship between them in Persuasion but I think that showing this really helps build sympathy for both James and Laurel. On the one hand she is all he can rely on and she is letting him down, but she is just 18 and he's steamrolling her somewhat so that she feels she can't tell him to slow down. Fast forward another 8 or so years and Laurel's life is pretty lonely whereas James has become a huge success, having invented some software that has made him a millionaire. He's never had another relationship that he could commit to after Laurel and living in the middle of nowhere Laurel hasn't exactly had many chances of finding love. She wishes that she hadn't let James out of her life all those years ago, but doesn't believe that he'd be interested in trying again. Although this book works as a romance in its own right I think having read Persuasion gives an extra dimension, as you have the added enjoyment of spotting people and events from Miss Austen's masterpiece and on the whole they were well-represented, although I wanted to give James a bit of a wake up shake a few times! Some of the updates were pretty ingenious, such as the fall and head injury from the original becoming a water skiing accident. I liked the update of the letter but felt it was delivered too publicly. Having said that, I can't see anybody managing to equal that letter from Persuasion, it was perfection! I really enjoyed this book and I'd definitely recommend it. Karen M Cox has also written an updated version of Pride and Prejudice, '1932', set in the US depression which is also well worth reading in my opinion.